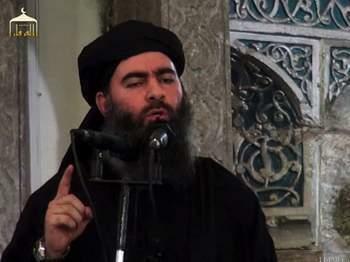 The leader of the Islamic State group urged followers to burn their enemies everywhere and target "media centers of the infidels," according to an audio recording released Thursday that the extremists said was by Abu Bakr al-Baghdadi. The reclusive leader of Islamic State, who has only appeared in public once, also vowed to continue fighting and lavished praise on his jihadis for their valor in the battlefield — despite the militants' loss of the northern Iraqi city of Mosul in July. "You soldiers of the caliphate, heroes of Islam and carriers of banners: light a fire against your enemies," said al-Baghdadi, a shadowy cleric who has been surrounded by controversy since the Sunni terror group emerged from al-Qaida in Iraq, its forerunner. Russian officials said in June there was a "high probability" that al-Baghdadi had died in a Russian airstrike on the outskirts of the Syrian city of Raqqa, the group's de facto capital. US officials later said they believed he was still alive.